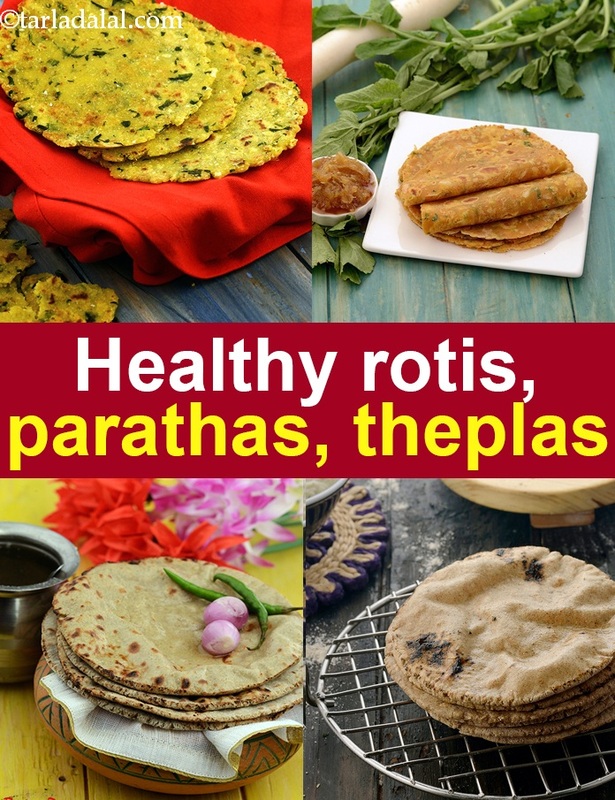 Healthy Rotis Healthy Parathas and Theplas, Healthy Rotis Parathas and Theplas for Breakfast. Parathas and theplas are often considered unhealthy because of the amount of oil used to cook them and also because of the use of ingredients like plain flour in the dough. However, all it takes is a few healthy twists to transform this versatile category into a satiating and delicious breakfast! There are innumerable theplas and parathas that you can prepare using whole grain flours, reinforced with grated veggies, herbs or greens; and a stuffing of healthy ingredients like low-fat paneer, dal or veggies; all cooked in minimal oil, to make a tasty treat! Bajra flour is high in protein and is a complete protein for vegetarians when combined with dal. So as a Vegetarian, include bajra in your diet. Bajra is a great option for those on a gluten free diet. Bajra is rich in Magnesium which improves insulin response by lowering insulin resistance which is good for Diabetics and a healthy heart. You can start with the basic bajra roti recipe which is fibre rich. Adding vegetables to your roti is always good as in bajra cauliflower roti recipe, lehsun bajra kaddu roti recipe or bajra gajar paratha recipe. Bajra stuffed with paneer is rich in Vitamin C and super healthy. For those on weigh loss, replace the full fat paneer with low fat paneer. There are those who are scared to have full fat paneer. Remember that full fat paneer is made of healthy fat and recommended to be avoided by only those with diabetes and heart issues. Why use jowar flour is something we always wanted to know. Jowar is a complex carb and will be absorbed slowly in the blood stream and not cause a spike in insulin. Jowar and all Millets are rich in Potassium. Potassium is critical for those with High Blood Pressure as it lessens the impact of sodium. Hence a good safe food for diabetics and also for those who want to live and eat healthy. You can have the basic jowar roti recipe. Then jowar pyaz ki roti which which will reduce acidity or the mooli jowar ki roti recipe which is gluten free. Or mix two healthy flour for the jowar bajra garlic roti reccipe. Why use makkai ka atta is something we always wanted to know. Maize flour ( makai ka atta) : Maize flour is a carbohydrate rich and energy rich flour loaded with fibre. Cornmeal prevents your blood sugar from shooting up and loaded with Zinc which is necessary for the formation of insulin. Maize flour is a good source of magnesium which is necessary for maintaining a steady heartbeat and normal blood pressure. The fibre binds with the bile salts and throws it out of the body, which helps in reducing the cholesterol from the body and good for heart. Try two flour combo of makkai ka atta and whole wheat flour in methi makkai ki roti recipe where methi is an excellent source of iron and Vitamin A. Parathas are a must for Punjabi breakfast and makai mooli methi paratha recipe is perfect and gluten free. Tikkar is a famous Rajasthani roti made from makkai ka atta and whole wheat flour, loads on onions and spices. So what is the famous Thepla made of. The base is whole wheat flour. Whole wheat flour is excellent for diabetics as they will not shoot up your blood sugar levels as they are a low GI food. Whole wheat flour is rich in Phosphorus which is a major mineral which works closely with calcium to build our bones. Enjoy the basic thepla recipe. Methi leaves help in improving glucose and insulin responses, hence good for diabetics. So make methi thepla recipe. Radish has many heart protective nutrients like Vitamin C, folic acid, calcium, potassium and flavonoids. They are an amazing source of fibre which helps in lowering cholesterol levels. So try our mooli thepla recipe. Enjoy our Healthy Rotis, Healthy Parathas and Theplas, Healthy Rotis Parathas and Theplas for Breakfast and other breakfast articles below. Bland jowar flour complements the pungent taste of radish in these simple but wholesome rotis. Accompany the rotis with curds and enjoy it as a meal. Green chillies add a pungent touch to these rustic maize flour and fenugreek rotis. Maize flour is difficult to roll so use a light hand while making the rotis. The wheat and soya chunks ensure that you get the necessary protein and amino acid intake for the day. These parathas are delicious can be made in a jiffy, an ideal way to use up leftover rice too.